Start-ups and small businesses have been dominating the business scene in recent years. Most of these start-ups and small businesses are a great success and transforming the world for better since their inception. Start-ups and small businesses demand a great deal of hard work and attention in their initial phase because it is this early phase that majorly defines the success of any new business or start-up. So start-ups must provide extra attention during this phase of their business. There are many hard working people and their creative minds behind any start-up’s success. These are the people who manage it all, ranging from recruitments to meeting deadlines and goals. In this entire process, start-up people tend to overlook the important aspects of finance and accounts. This ignorance can cost a lot to the start-up owners both in terms of profits and longevity. It is here that DNS Accountants has come up to help start-ups and small businesses in managing their finances and accounts in the most efficient manner. DNS Accountants, being an experienced accountancy and financial services provider, has the most experienced and talented accounting personnel who are capable of resolving all kinds of concerns related to accounts and finances of any organization. Apart from exceptionally talented employees, we possess the latest techniques and software solutions that are extremely helpful in effectively managing our clients’ accounting needs. We help our customers during their initial phase by providing them with a full-fledged setup and all the guidance they need to fulfill all compliances with Companies House and HMRC. We provide a fully dedicated accounting personnel to our client, be it a chartered accountant or an IT accountant depending upon their needs. This dedicated account manager is always available for listening to our client’s concerns and to provide them with intelligent solutions. Under this service, we deliver amazingly helpful accounting software solutions to our customers as per their needs. The smart cloud software that we provide to our clients can be accessed from anywhere, anytime and is way better than what the competitors in the market offer. Being a Port city in England, Southampton has always been a desired location for various types of businesses. This town has considerable employers in different fields like retail, docks, education and health care sectors. This offers great opportunities for start-ups and small businesses in Southampton. Southampton has also seen increased developments in real estate industry. Southampton is amongst the best locations for establishing a new business or start-up in the country. This city offers all the required and desired resources for setting up small businesses and allows them to earn significant profits. Being a much-desired location for establishing start-ups and new ventures, Southampton also opens great opportunities for expert accountancy services of DNS Accountants. All these newly formed start-ups and even well established small businesses require help in managing their accounts and finances. They demand experienced guidance and effective solutions to meet their needs. And we, at DNS Accountants, provide the perfect solutions for all their accounting needs and queries. We provide the best Contractor Accountants in Southampton who are capable of solving all kinds of finance and accounting issues of our clients. With the establishment of new start-ups and small businesses, the demand for chartered accountants in Southampton has also seen a great increase. Now, there is a heavy demand for chartered accountants in this city. 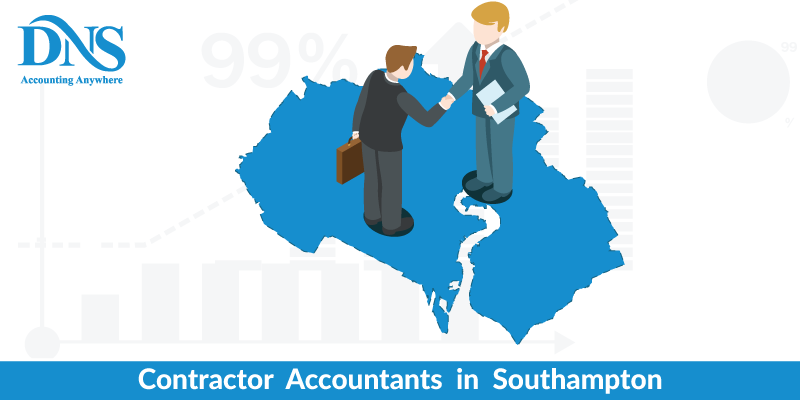 The work and opportunities for online contractor accountants in Southampton have also increased in past few years in response to the new business establishments in the city. There is also a heavy requirement of IT contractor accountants in Southampton. Now the businesses here have started using various software solutions for managing their accounts and finances. They need IT accountants for training their employees to use such software. Being home to a large number of small businesses, there is also a heavy demand of Small Business Accountants in Southampton. These people analyze and understand the basic workflow of small businesses and guide them to manage their finances in an improved way. DNS Accountants is one of the leading organizations delivering all kinds of accounting solutions in England. Our experts have solutions to any and every concern of yours related to accounts and finance. Moreover, our experience in this industry allows us to provide the best possible solutions for you. We, with our best contractor accountants in Southampton, are your perfect partners to resolve all your accounting concerns and issues. In England, it is necessary by law for businesses and companies to have ROA i.e. Registered Office Address. Registered Office Address is the official address at which your company is legally registered upon incorporation. It is the address that Company House displays on its Public Register of Companies. All the organizations are required to possess ROA. DNS Accountants helps its clients to handle this matter by allowing them to nominate DNS as their ROA. By doing this, our customers save their personal addresses from becoming public. We forward all your mails to your address as soon as we receive them. Moreover, we also offer ROA service under which our professional accountants answer to all kinds of queries on your behalf. We possess significant experience and are experts in writing innovative plans aimed at business growth and multiplication of profits. With our expert financial management and report preparation services, we offer the best business growth strategies to our clients. Apart from Southampton, many other cities are witnessing the growth of several new small businesses and start-ups. Some of such cities are Marchwood, Totton, Netley, Bursledon, Hythe and Bristol. All these cities also need highly experienced, and talented accountants and we at DNS Accountants are here to address all their accounting, finance and taxation requirements with our comprehensive range of services!